Retiring doesn’t mean you need to stop working. You may want to work in retirement for several reasons including filling your time, feeling productive, or making ends meet. 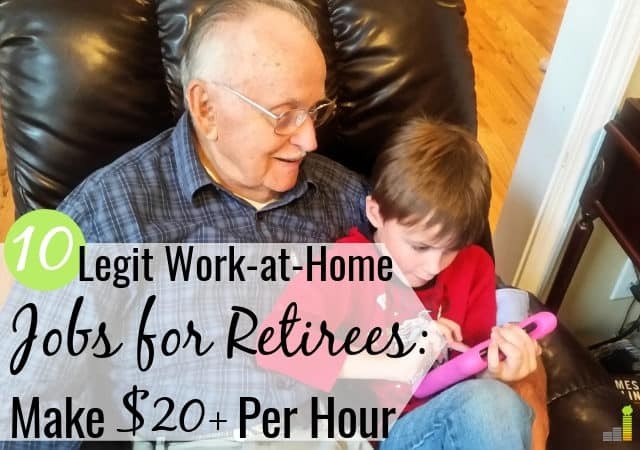 Fortunately, there are ways to make money in retirement that don’t require a typical job, and many of the best work-at-home jobs for retirees let you earn money on your schedule. If you want to make money from a hobby in retirement, or just make extra income, this post is for you. Some of the best work-at-home jobs for seniors give you the flexibility to do what you want when you want while still earning an income. You can work a job that requires a specialized skill, or one that requires little skill. If you have an open mind, the possibilities are endless. 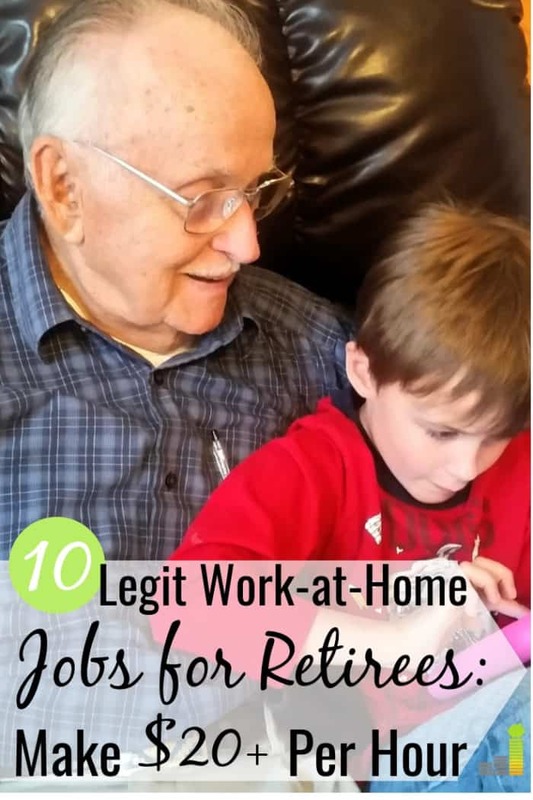 Below are 10 of the best work-at-home jobs for retirees to make additional income. If you love reading, one of the best work-at-home jobs for retirees is professional proofreading. Proofreading isn’t the same as leisure reading. You have to actively examine the text for spelling, grammar, and other mistakes throughout the works you’re assigned to proofread. However, this type of work can be very rewarding if you love looking for typos and errors. You can also work from home as proofreader on your own time. It can be a great way to make extra money on the side as many proofreaders make $20+ per hour. Proofread Anywhere is a great resource if you want to be a professional proofreader. Run by our friend Caitlyn Pile, she teaches you how to grow a business from her own experience as a proofreader. The course is free to attend and is helpful for both general proofreading and for transcript proofreading. A virtual assistant (VA) is someone who helps other business owners complete tasks they’re either not good at or tasks they don’t want to spend their precious time on. The best part of working as a virtual assistant is you get to work from home (or anywhere else!). You can expect to make anywhere from $15 to $25 per hour as a VA – more if you have a specialized skill. To learn how to become a VA, you can take Kayla Sloan’s 10K VA course. In it, she shares the process she used to scale her virtual assistant business from $0 to over $10,000 per month. Teaching and tutoring students is a great way to earn money from home as a retiree. Thanks to the Internet, you now have access to teach people across the globe. In fact, there are a lot of opportunities to teach English online from home and make at least $15 per hour. You can also expect most companies to handle all administrative tasks, enabling you to focus on teaching. VIPKid: VIPKid is a popular teaching site that offers an American elementary education experience to Chinese students ranging from four to 12 years old. You can set your own schedule, and VIPKid handles all of the administrative tasks. Gogokid: Gogokid differs from VIPKid as you only teach one child per session. Gogokid does require you to have at least a Bachelor’s degree to teach students. The best part of Gogokid is they offer a $300 bonus to start! EF Education First: EF Education First is the largest foreign language company in the world. Like the other opportunities, you get to set your own schedule. You can also teach children or adults with EF Education First. Teaching English as a second language is a rewarding way to help others and one of the top work-at-home jobs for retirees. However, others are relying on you to help them learn, so you may have to agree to a regular schedule for a fixed period until a class is complete. Hours and the time of day you teach vary based on where your students live. You won’t get rich taking surveys, but they can be a great way to monetize your free time. You can take surveys while watching TV, waiting at the doctor’s office, or doing other mindless activities. Companies love to get our feedback on products we use, television shows we watch, or our opinion on a political campaign. Most survey providers pay in cash, or you can redeem points for free gift cards. Survey Junkie: This is our top survey site since they pay you cash straight to PayPal or let you redeem rewards for Amazon gift cards and other retailers. Pinecone Research: This site pays $3 per survey and you can choose between PayPal, Amazon, or restaurant gift cards for payment. They also pay you to do product testing. Ipsos i-Say: Founded in 1975, Ipsos is one of the oldest survey sites in the market. Ipsos offers a lot of survey and product testing opportunities, with a low redemption threshold of only $5, or 500 points. You can also enter into free drawings (one entry per survey) for extra cash and travel. Again, you won’t get rich with surveys. However, you can pair it with other work-at-home jobs for seniors and make money in your spare time. If freelancing isn’t for you and you’d prefer a more traditional job, look for companies hiring for work-from-home positions that fit your skill sets. Some jobs offer flexible hours while others require normal or regular work hours. However, you can keep searching until you find the perfect traditional work-from-home or remote job for your situation. Working from home is ideal, but sometimes working at someone else’s home isn’t too bad, either. Babysitting is a great way to work from home or someone else’s home. Websites like Sitter.com can connect you with potential babysitting clients or you can find clients on your own. You can also post on social media that you’re looking for babysitting gigs, or simply ask friends for referrals. If you’re babysitting at your house, you’ll need to make sure your home is a safe environment for the children you’re watching. You can do this by child-proofing your home or designating an area in your home that will just be for your clients. You can also show clients you take babysitting seriously by getting CPR and first aid certified. Pest are often treated as another member of the family. Unfortunately, people can’t always take their pets with them when they travel. Sometimes hotels or airlines don’t allow dogs while other times it doesn’t make sense to bring a pet along on a family vacation. You can fill the need for pet care by offering pet sitting services in your community. You can sign up to offer pet sitting services on sites like Rover and Sitting for a Cause or advertise on your local Craigslist or Facebook Marketplace pages. Housesitting is a great way to make extra money in retirement if you don’t mind checking in on or temporarily living in other people’s homes. Sites like HouseSitter.com help you find housesitting opportunities. While some housesitting jobs only require daily visits to a home to complete household chores, some clients want you to live in their home while they’re gone. However, it’s up to you to decide what you jobs you want. If you’re not comfortable staying in someone else’s home, pick the gigs that only require the daily visits. Housesitting can be a great way to make extra cash with minimal skill and time commitment. You don’t have to get a traditional or freelance job to earn money in retirement. In fact, you can make money from a hobby in retirement. If you’re going to pad your budget, why not do it with something you enjoy and were going to do anyway? Have you ever had someone compliment you on something you made? Perhaps someone really admired the photographs you take or your woodworking skills. Believe it or not, it’s possible to turn your arts and crafts hobbies into a small, income-earning business. You can test the waters by posting some of your works for sale on websites like Facebook Marketplace or Craigslist. Another option is attending a farmers market or festival to see if your crafts sell. If they do, continue making what sells and tweak your offerings after each event or sale. Eventually, you could have a full-blown business with a decent income on your hands. Do you love to write? You may want to consider freelance writing. Traditionally, people think of freelance writers as those who write for magazines and newspapers. However, there is a huge need for online content, too. You can write for major news websites, blogs, and businesses. You’ll have to build a portfolio, especially if you want some higher paying jobs, and it takes time to get started, but it is possible to earn (sometimes significant) income as a freelance writer. If you like writing but want to write your own content rather than what other people tell you to write, blogging might be for you. Bloggers aren’t guaranteed to earn money from their websites, but some bloggers end up making a comfortable living running their websites. It is important to note that it could take months or years before you make significant income from your blog. However, some blogs could see a decent income in just a few months. One important tip to keep in mind is that in order to have a successful blog, you need to write what people want to read. Check out our guide on how to start a blog to get additional insight on what steps to take to start a money-making blog. Before you consider working at home as a retiree, keep Social Security benefits in mind. You need to be careful if you’re claiming Social Security and plan to earn income, too. You should consult a financial professional to determine the impact for your particular situation. That said, here are the rules as we understand them from the Social Security Administration’s website. If you claim benefits prior to full retirement age, your Social Security benefits may be reduced if you earn more than a fixed amount of income. In 2018, you can earn up to $17,040 without reducing your Social Security benefits if you’re under full retirement age for the entire year. For each dollar above that, your Social Security benefits will be reduced by $1 for every $2 you earn. In the year you turn full retirement age, the rules are slightly different. In 2018, the limit in the year you turn full retirement age is $45,360 but they only count earnings before the month you reach your full retirement age. Benefits are reduced by $1 for every $3 you earn above the limit. The best work-at-home jobs for retirees let you be productive while earning additional income. As you can see, there are no shortage of opportunities available to make extra money. Just make sure you’re still taking the time to do the things you enjoy. After all, that’s what retirement is for. What are other work-at-home jobs for retirees you’ve seen as opportunities? Do you have some favorite ways to make extra money? What do you plan to do in retirement? Lance Cothern is an experienced personal finance writer and founder of the personal finance blog Money Manifesto. He and his wife worked to pay off over $80,000 of student loan debt in less than three years. His work has appeared in many publications, including U.S. News and World Report, USA Today, MSN, Wells Fargo, Business Insider, Credit Karma and LendingTree.